The Nodes of the Moon ... sounds like an astrological disease, doesn't it? Something you should run far, far away from. Well, relax. Your nodes will not kill you. In fact, they are your birth chart’s finest indicator of talents you’ve become super proficient at during previous incarnations, as well as qualities you decided to move toward and master in this lifetime. Before we explore all of the juicy metaphysical meaning behind the Moon Nodes, however, here’s a necessary explanation about what they are in the physical sense. Interestingly enough, the nodes of the Moon aren't real points you will find in space. They aren't part of the Moon or another planet. They're not asteroids, fixed stars or anything you can see with a telescope. They are imaginary points. Now, this doesn’t mean we’re talking about astrological fiction here. Far from it! Consider the band of sky that astrologers call the "ecliptic." The ecliptic is defined as the apparent path of the Sun as seen from our perspective here on Earth. This band of sky is where all those constellations are from our view. The Moon has its own path around Earth. The nodes then, are the imagined points in space where the orbit of the Moon crosses the ecliptic. There is one pointing north, the other south, and they will always be found in signs exactly opposite one another. 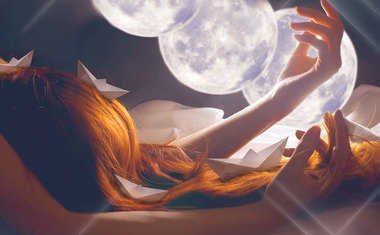 The nodes of the Moon have deep karmic significance in Astrology. The South Node represents your past. If you believe in reincarnation, this will include past lives. Some astrologers call it accumulated baggage, but that’s a misleading word because it implies that everything connected to your South Node or past needs to be disposed of like garbage. Nothing could be further from the truth! When it comes to your Moon Nodes, the key is balance. The zodiac sign and house your South Node is in will reveal an incredible amount of information about what you’re really good at. These are the talents and abilities that you’ve perfected from many lives (or this one if you’re not a fan of reincarnation). Unfortunately, what we’re totally awesome at tends to become the path of least resistance. This is the trap of the South Node. You’ve "been there and done that" already when it comes to your South Node so many times that you can literally do it with your eyes closed and your hands tied behind your back. There’s no more potential for growth with the South Node. Exaggerating the qualities of your South Node is way too easy -- especially since we humans naturally prefer to remain in the safety of what we know so well. Expressing the qualities of your South Node, by sign and house, is as natural as breathing. The North Node, on the other hand, is uncharted territory. This is the place your soul has never explored before. Yes, the future might be uncertain, but your North Node, by sign and house, tells you that if you’re willing to develop these qualities, you will achieve tremendous soul growth. 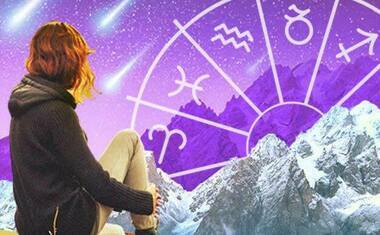 Following your North Node means getting over a certain fear and taking a leap of faith. The spiritual and physical rewards of doing this however, are incredible. When you follow your North Node, there is fulfillment and spiritual prosperity. Success is promised when you "go north." This North/South Node dichotomy leads many to assume that the South Node is basically an abyss full of muck while the North Node is gold. Don’t fall into this trap! The trick is learning which qualities in your South Node are holding you back from pursuing your North Node. Those are the qualities you’re meant to temper or leave behind. But if you use your South Node gifts to actively pursue your North Node destiny ... well then you’ve mastered the delicate balance of this mysterious axis in the birth chart. 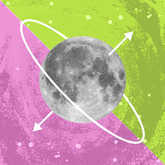 The nodes of the Moon are definitely worth getting to know in your chart. Your soul, after all, wants to grow. The Moon nodes are instant cosmic navigation that, when properly understood and utilized, will help you achieve ultimate soul evolution. And that’s node joke!